Seeing Dia at the ‘Acid Factory’ premiere brought back memories of Tabu in her one shouldered-gown. 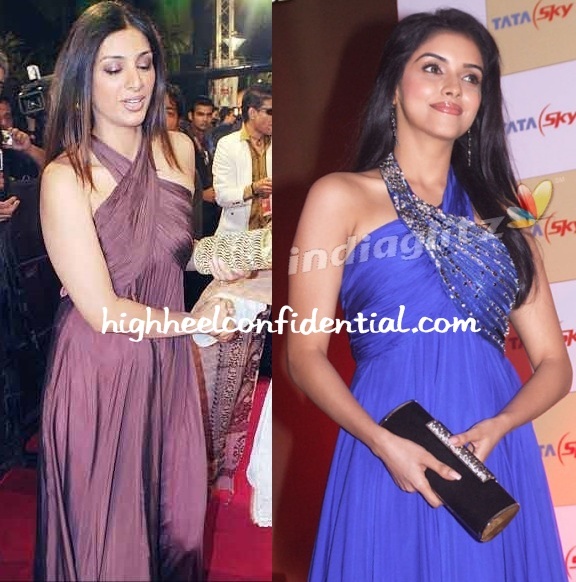 Yes, we know that except for the color and the metallic underlay in Tabu’s gown, there isn’t much similarity. But, that is probably the reason why we like this gown on Tabu more. The mustard/gold color and the choker halter detail were a bit much for my taste which is why I didn’t like this Gavin Miguel number on Mugdha. Your thoughts? For more pics of the Asin event, go here. While you can catch our review of Asin on our MTV column here, we must add that it is good that Asin wore her DvF differently else Tabu (who wore Gavin Miguel) and her would have come off wearing the same look. Thanks ‘Sudha’ for the DvF tip-off.